Lisa Hobbs holds a picture of her husband, Gene "Pius" Hobbs. Hobbs was raking gravel with the Meade County public works crew when a dump truck backed over and killed him. 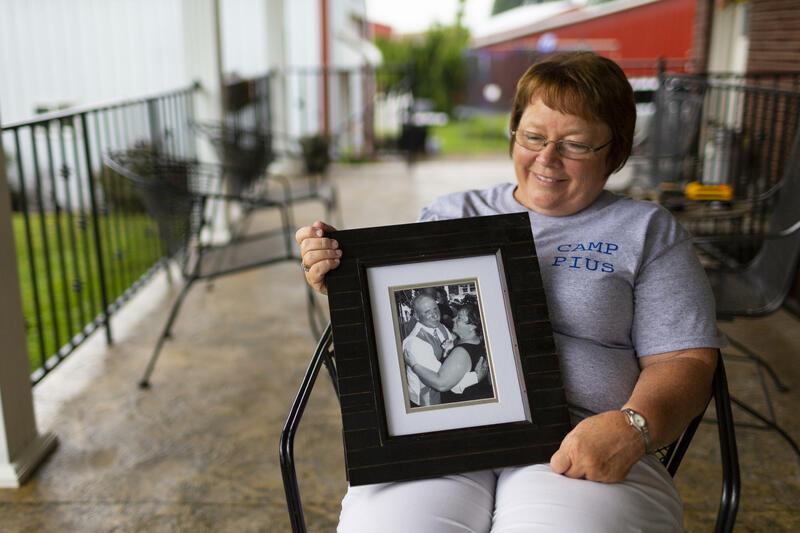 On what would have been her 43rd wedding anniversary, Lisa Hobbs stood in the front yard of Camp Pius, the farm handed down through her husband's family for generations. She watched as the very same dump truck that killed her husband rolled down her country lane. In December 2016, Pius "Gene" Hobbs was raking gravel with the Meade County public works crew when a dump truck backed over him. The driver then accelerated forward, hitting him a second time. Hobbs was crushed to death. The sole eyewitness to the incident said that the dump truck's backup beeper wasn't audible at the noisy worksite. The Kentucky State Police trooper on the scene concurred. Hobbs might not have been able to hear the truck coming. But when Kentucky Occupational Safety and Health arrived, hours later, the inspector tested the beeper on a quiet street and said it wasn't a problem. More than a year later, Lisa Hobbs worried that the same truck could be endangering others, just like her husband. When she saw it reverse down her street, she listened to hear if anything had changed. "No backup beeper," she said, more indignant than mournful. "No backup beeper." The KY OSH inspector also failed to interview the sole eyewitness, didn't document employee interviews and overlooked possible safety violations at the worksite. "These shortcomings are very concerning," says Jordan Barab, a workplace safety expert who served as Deputy Assistant Secretary of Labor for Occupational Safety and Health under President Barack Obama. "Identifying the causes of these incidents is ... vitally important." Otherwise, the employer doesn't know how to avoid the next incident, he says. Gene Hobbs' case is not the exception. In fact, it's the norm, according to a recent federal audit. Kentucky is what's known as a "state plan," meaning the federal Occupational Safety and Health Administration has authorized it to run its own worker safety program. Every year, federal OSHA conducts an audit of all 28 state plans to ensure they are "at least as effective" as the federal agency at identifying and preventing workplace hazards. According to this year's audit of Kentucky, which covered fiscal year 2017, KY OSH is not meeting that standard. In fact, federal OSHA identified more shortcomings in Kentucky's program than any other state. The audit was sharply critical, depicting an understaffed, under-resourced agency that's failing to protect Kentucky's workers. It also included a special study exclusively examining how Kentucky falls short at investigating deaths on-the-job. In a statement, the federal Department of Labor said it is working with Kentucky on a corrective action plan. Barab says the feds have the authority to take over state-run programs that don't meet federal standards. "Having a state program is a privilege, not a right of the states," says Barab. "Certainly, it requires the states to address rapidly and seriously any problems that are identified by federal OSHA." 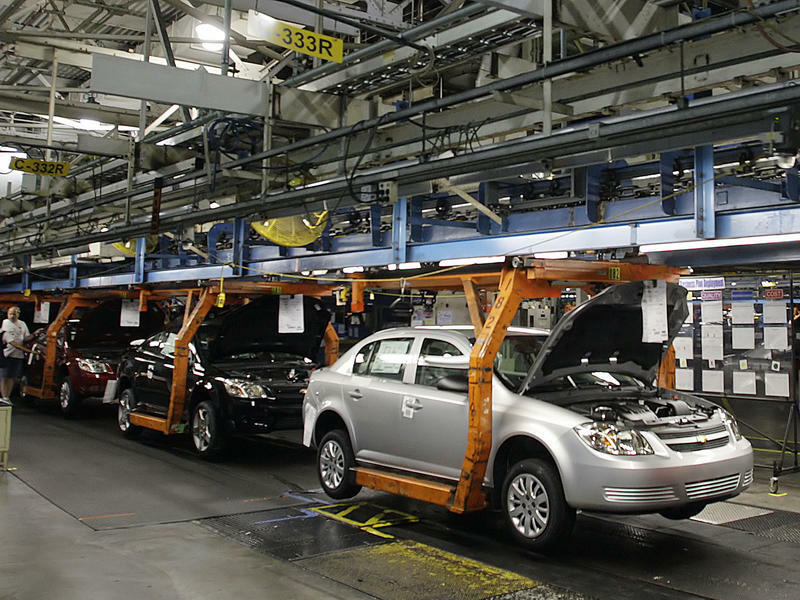 The Kentucky Labor Cabinet declined multiple interview requests for this story, but speaking to WKMS public radio in Murray, Ky., in April, then-Labor Secretary Derrick Ramsey explained how the state approaches companies about possible worker safety violations. "We are going to educate, we're going to educate, we're going to educate and we're going to educate, and then citate," said Ramsey. But an opt-in, voluntary education program may not be enough to prevent injuries, illnesses and deaths on the job over time, according to experts. "Without a really strong enforcement unit ... these voluntary compliance assistance programs are not going to be able to do the job," says Laura Stock, the director of the Labor Occupational Health Program at the University of California, Berkeley. She says what's happening in Kentucky reflects a national trend. Republican Gov. Matt Bevin's administration has shown to be strongly pro-business and anti-regulation. Kentucky's first Republican-majority legislature in nearly 100 years has helped advance this agenda, passing Right-To-Work laws, repealing the prevailing wage and rolling back workers compensation benefits. When Gene Hobbs was run over by a dump truck in 2016, Kentucky issued no violations or fines to his employer. A KY OSH supervisor wrote in an email that Hobbs walked behind "an apparently completely compliant dump truck, back up alarms working." The supervisor added that Hobbs just "zigged when he should have zagged." His widow, Lisa, got a copy of that email through an open records request. "We know that's not the truth," she said. "It's not the truth." Federal OSHA agreed. After she filed a complaint about the state's handling of her husband's death, the feds reinvestigated. In a report, the agency concluded that the worker safety inspector failed to interview the eyewitness, missed possible worker safety violations and hadn't done enough to test the dump truck's backup beeper. 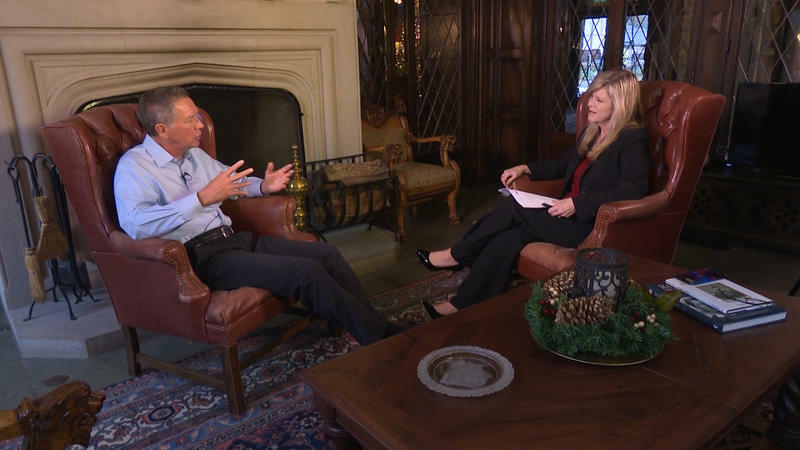 Lisa Hobbs says she felt vindicated, but it raised many questions for her about how the state could come up so short. "I feel like we're not the only ones," she said. "There's a lot out there." KY OSH investigated 44 deaths in a two year period. According to the federal audit, there were serious shortcomings in a vast majority of those investigations. Kentucky's worker safety agency has a lot of problems. That's according to a recent audit by the federal Occupational Safety and Health Administration, or OSHA. The report says the flaws in the program have in some cases been fatal. From the Kentucky Center for Investigative Reporting, Eleanor Klibanoff reports. 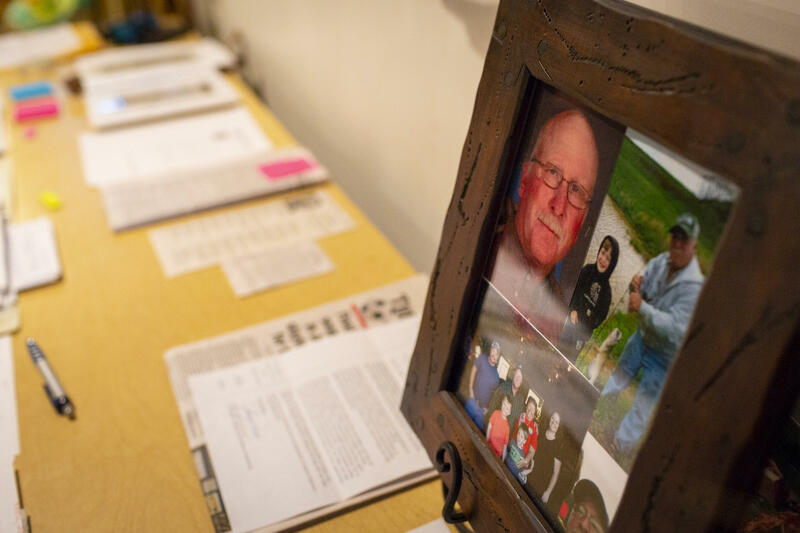 ELEANOR KLIBANOFF, BYLINE: On what would have been her 43rd wedding anniversary, Lisa Hobbs stands in the front yard of Camp Pius, the farm handed down through her husband's family for generations. She watches as the very same dump truck that killed her husband rolls down her country lane. In December 2016, Pius Gene Hobbs was raking gravel with the Meade County public works crew when Dump Truck Number 225 backed over him. The driver then accelerated forward, hitting him a second time. Hobbs was crushed to death. LISA HOBBS: OK, let's hear that one. HOBBS: No backup beeper, no backup beeper. KLIBANOFF: More than a year later, when Lisa Hobbs sees that same truck Number 225 reverse, she hears how nothing has changed. On the day of her husband's death, both an eyewitness and a state trooper said the truck's backup beeper was not audible. Hobbs might not have heard the truck coming. But Kentucky Occupational Safety and Health said the beeper wasn't a problem. That was after testing it on a quiet street hours later. The same inspector failed to interview the sole eyewitness and overlooked possible worker safety violations at the worksite. JORDAN BARAB: Well, these shortcomings are very concerning. KLIBANOFF: Jordan Barab is a workplace safety expert who ran federal OSHA under President Obama. BARAB: Identifying the causes of these incidents is also vitally important because otherwise the employer doesn't know how to avoid the next incident. KLIBANOFF: Gene Hobbs' case is not the exception. In fact, it's the norm. That's according to an annual audit that federal OSHA conducts of all 28 state-run worker safety programs. The most recent audit of Kentucky, which covered fiscal year 2017, was sharply critical - depicting an understaffed, under-resourced agency that's failing to protect Kentucky's workers. Federal officials specifically criticized how the state investigates worker deaths. In a statement, the Federal Department of Labor said it's working with Kentucky on a corrective action plan. Barab said the feds have the authority to take over state-run programs that don't meet federal standards. BARAB: Having a state program is a privilege not a right of the states. And certainly it requires the states to address rapidly and seriously any problems that are identified by federal OSHA. KLIBANOFF: The Kentucky Labor Cabinet declined to comment. But speaking to WKMS Public Radio in April, then-Labor Secretary Derrick Ramsey explained how the state approaches companies about possible worker safety violations. DERRICK RAMSEY: We're going to educate. We're going to educate. We're going to educate. And we're going to educate and then citate. LAURA STOCK: Without a really strong enforcement unit, these voluntary compliance assistance programs are not going to be able to do the job. KLIBANOFF: Laura Stock is the director of the Labor Occupational Health Program at the University of California, Berkeley. She said what's happening in Kentucky reflects a national trend. Republican Governor Matt Bevin's administration has been strongly pro-business and anti-regulation. When Gene Hobbs was run over by a dump truck, Kentucky issued no violations or fines to his employer. A state worker safety supervisor wrote in an email that Hobbs walked behind, quote, "an apparently completely compliant dump truck, backup alarms working." The supervisor added that Hobbs, quote, "just zigged when he should have zagged." HOBBS: We know that's not the truth. It's not the truth. KLIBANOFF: Federal OSHA agreed with Gene Hobbs' widow Lisa. In a report, the agency found that the state failed to interview the eyewitness, missed possible worker safety violations and hadn't done enough to test the dump truck's backup beeper. HOBBS: We're not the only one. There's a lot out there. KLIBANOFF: Kentucky Occupational Safety and Health investigated 44 deaths in a two year period. According to the federal audit, there were serious shortcomings in a vast majority of those investigations. For NPR News, I'm Eleanor Klibanoff in Louisville. (SOUNDBITE OF THE BURNING PARIS' "COLDER") Transcript provided by NPR, Copyright NPR. 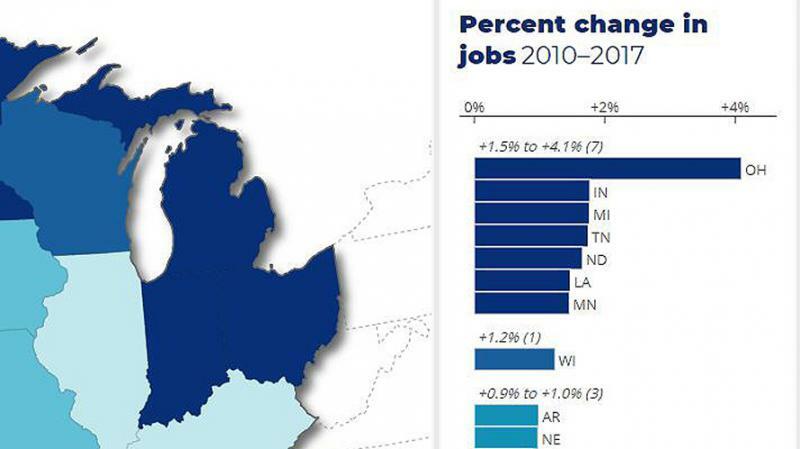 A new report from a D.C.-based think tank offers insight into how Ohio's economy has weathered the post-recession years compared to other Midwest states. The Brookings Institution report released Wednesday, called The State of the Heartland Factbook 2018, looks at economic conditions in 19 mostly-Midwestern states since 2010.